What happened to dsa.msc in 2008 windows server. 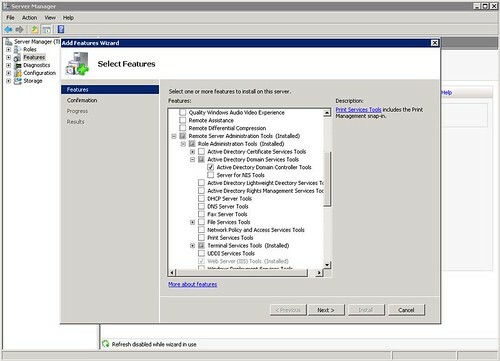 What happened to dsa.msc on windows 2008 server? A simple yet effective tool for admins and other tech support specialists that often had to access AD users and computers on the fly. Simply running this command on a windows 2003 member server would open the domain users and computers and allow changes and addition provided the user account with which it was run had sufficient access privileges. In windows 2008 server this handy little feature is just that, a feature, and needs to be added separately. The image in this post shows which options to select to add the functionality back into the member server. If you used the command a lot then it's worth the several minutes to add it. It could wind up saving you server and user administration time in the long run and it doesn't require a restart. Just install and go.